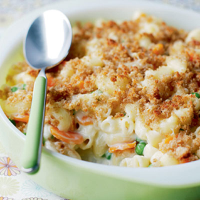 This tasty pasta bake is laden with sweet carrots and colourful peas and is an enticing way to encourage children to eat their vegetables. Bring a pan of water to the boil. Add the pasta and carrots, return to the boil and cook for 5 minutes. Add the peas, return to the boil again and cook for a further 2-3 minutes or until the vegetables and pasta are tender. Drain then return to the pan. Add the cheese sauce to the pasta pan with three quarters of the grated cheese. Heat gently, stirring until smooth. Season to taste. Tip into a shallow, heatproof serving dish. Mix together the breadcrumbs, butter and remaining cheese and sprinkle over the top. Cook under a moderate grill for 4-5 minutes until the top is crisp and golden. Serve warm. When draining cooked pasta, always leave a little water clinging to it. This keeps the pasta moist and stops it absorbing the sauce, so the finished dish is not dry.